Bure View - Country holiday in a converted mill near the coast, the countryside and the Broads in the lovely village of Buxton just minutes away from Norwich, Aylesham and Wroxham. A well apportioned penthouse suite in a converted 18th Century watermill located in the center of the beautiful Norfolk countryside. Excellent for discovering the Norfolk Broads, the Norfolk Coast and the Norfolk Fens. Bure View is steeped in history, the watermill was recorded in Doomsday in 1085 and William Pepper, a merchant living in Buxton, last rebuilt it as a mill in 1754. The building was constructed of white painted brick and weatherboard with a pantile roof and has been a prominent landmark in the village for many years..
Bure View is conveniently located, only 2 miles from the Broads and 10 miles to the coast. Although set in a Grade II listed building, Bure View has all the modern conveniences such as an oven,gas hob, fridge, freezer, dishwasher, washer/dryer, TV, DVD player, FreeView box and much much more. All the furniture is antique, lovingly restored by a local craftsman and with the view of Bure, it is a fantastic place to unwind. A beautifully appointed and equipped self catering holiday apartment in a tranquil setting in the middle of the Norfolk countryside. 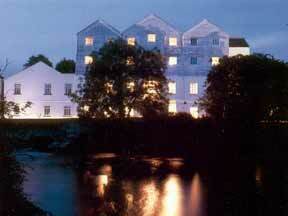 The mill was reconstructed and fully refurbished in 1999 to private 9 exclusive apartments. Beautifully appointed with open pine beams, this two bedroom, two bathroom penthouse occupies the rear of the Mill and overlooks the tranquil mill pond which is host to several ducks, a pair of swans and many other river dwellers and visitors. Nestled in the countryside in Buxton and Lamas with little stone cottages and the Bure running through the centre, this is a very tranquil place. We are proud to offer this exclusive holiday apartment	for let and want to make your stay as enjoyable as can be imagined.